15 Ltr GAS IT EASYFIT gas tanks for VW's fords, renaults, fiat and many more Motrohmes, campervans or panel vans. - GAS IT Leisure Gas Bottles, Gas Cylincers and Gas Tanks - Catering, Motorhome, Campervan, Caravan, Farrier and Road Repair Refillable Gas Solutions. Did you know the GAS IT Smart Power Save Electronics for gas tanks with electic outlet valves was first designed, built and sold over 15 years ago? GAS IT leads and others follow. GAS IT has done it again for 2019 by producing the Worlds first small R67 approved 15 ltr 4 hole O.E.M specification vapour tank which comes with our long proven industry leading EASYFIT mounting feet and our usual market leading safety features built directly in every tank we sell. Its not surprising why the majority of well known new vehicle builders, who need a gas supply to run appliances in the vehicle, only choose GAS IT OEM vapour tanks over any other brand to make GAS IT an O.E. product. We have a proven pedigree in design, development, supply and have a large stock holding here in North Wales for all our GAS IT tanks. Our latest 15 ltr GAS IT EASYFIT tank offers ease of installation yet has the same top notch safety and high quality vapour only supply system built into it as all our GAS IT tanks do - No matter the size. In our latest small 15 ltr OEM specification tank we also offer the highest flow rate of any brand of 15 ltr vapour tank being sold to date, our tank has the largest flowing Liquid Phase Separator inside the tank (22mm Diameter), it has the furthest lean angle in its size class, all of which means compared to other 15 ltr tanks on the market currently you won't have any regulator or tank freezing when using the appliances, you can run more appliances than other small 15 ltr tanks plus no matter how you drive going round corners or if you park off road and the vehicle is leaning excessively to the left, right front or back our proven top notch built in Liquid Phase Separators will do it job and stop liquid coming out of the tank and only allow out vapour. 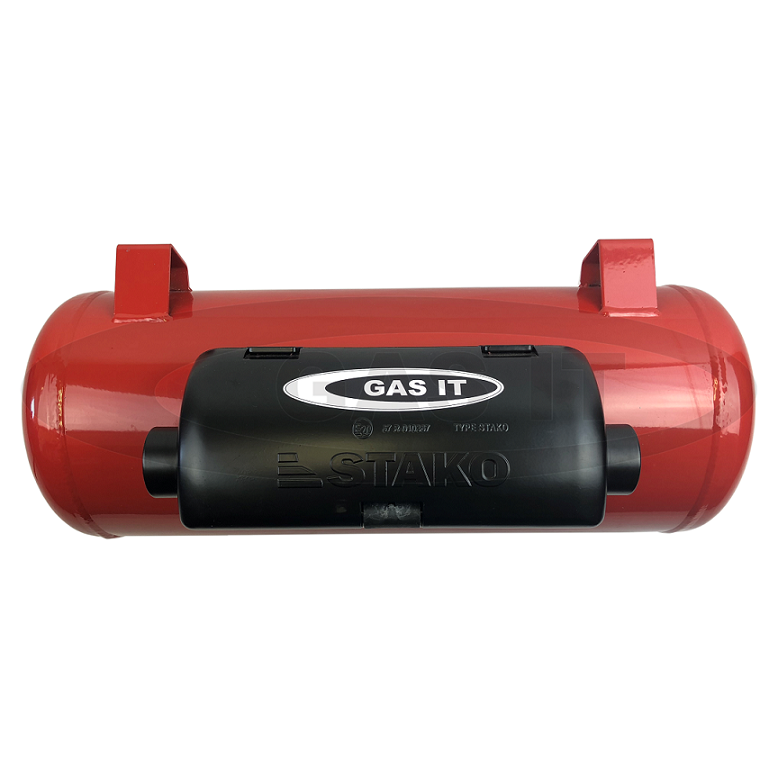 Like all our other GAS IT tanks this new smaller 15 ltr tank comes with either our traditional manual outlet tap option or you can also choose to have our ' Direct in tank' remotely operated hi flow electric outlet valve solenoid fitted in place of the manual tap for just £9.92 including VAT more. ( The same remote operated price option is on all our GAS IT tanks from 15 ltr up to 230 ltr ) We even have our own GAS IT Ultra Low Current Electronics to operate the gas valve for weeks and weeks without it flattening your vehicles battery. This small 15 ltr tank will be a perfect fit for any vehicle that has limited space underneath like the VW T5 & T6, Ford Transits, Renault Traffics, Nissans' Vauxhall's, Peugeots and many, many more small panel vans and campers that don't need more that the 12 ltr of gas the tank holds. We are sure everyone's next question will be are we going to be making a EASYFIT bolt on 15 ltr tank kit for these vehicles and the answer is we have already started. Some are listed already like the VW T5 and T6 kits and the GAS IT Universal 15 ltr tank kits so we expect to have the VW T5 & T6 kit available on the GAS It webshop in the next few days. In the meantime what we do know on the VW T5's new builds is that this 15 ltr GAS IT EASYFIT tank can be mounted in less than 10 minutes, doesn't use or need specalised Riv nuts ( just drill 4 holes and bolt it to the vehicle with the included nuts and bolts ) meaning from start to finish it took us less than 8 minutes to drill, mount and bolt up the tank using a cordless drill and M10 drill bit only. Also we designed it to allow it to be mounted higher under the floor than any other gas tank available so it works great with lowered VW's as the tank sits higher than the rear antirollbar by around 1 1/2 to 2 inches and higher than the spare tyre. Want to see the control system options we have to allow you to turn the Electric Remote Operated Solenoid Outlet Valve option fitted to our tanks then click here to see the comparison chart in our GAS IT Electronics & Valve Controllers - Low Voltage section. So if your buying another brand of 15 ltr tank and are fed up with it proving to be problematic, underpowered, has unreliable electrics, freezes regulators and are regularly out of stock with no back up or support direct from the designers and manufactures of the tank, then upgrading to a GAS IT OEM specification 200 diameter x 15 ltr 4 hole tank has to be the way forward for you and your customers - if only for peace of mind. Click here to head directly to the EASYFIT gas tank catagory on our webshop to see our new 15ltr OEM specifation vapour tank. If you want to contact us our email is Sales@GASIT.co.uk or phone 01286 832443.